Last night, I was in the mood to try something new for dinner. I wanted something light, easy to prepare, visually pleasing and of course, something yummy. I’ve been craving umami flavors a lot lately, specifically the earthy tastes featured in so many delicious Asian meals, so…I decided to take a crack at making the famous Vietnamese Banh Mi sandwich. Like anytime I set my mind to making something new, I spent time researching the various recipes online and in cookbooks. I discovered that the term Banh Mi actually refers to the bread itself, specifically the french bread introduced to Vietnam during its colonial period. 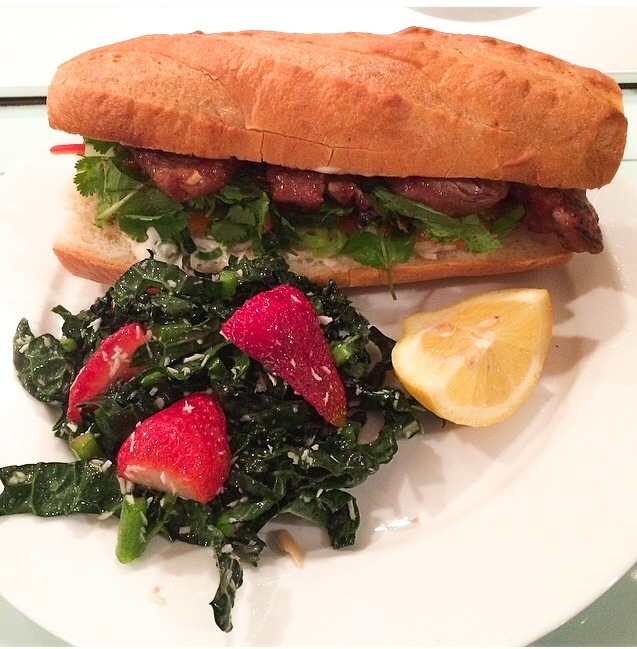 Fun filled fact – the sandwich combines both cultures, French and Vietnamese, with the ingredients used. The bread, mayonnaise spread, and the sometimes used variation of pork in pate form is clearly influenced by the French and the cilantro, peppers, pickled vegetables and umami sauces are the Vietnamese influence. As if I needed any other excuse to make this delicious sandwich, my decision to embark on this Banh Mi mission was solidified when I realized that the traditional protein is pork. I just reintroduced pork into my life but had yet to cook any pork other than bacon so I happily accepted the challenge. 🙂 I served my sandwiches with a yummy Coconut, Strawberry and Kale salad that I picked up at Whole Foods, but don’t you worry friends – I will make my own version and post it here soon! Ăn nào! – “Enjoy!” in Vietnamese. Mix all ingredients together and place in large Ziploc bag with raw pork. Allow to marinate for at least 10 minutes before searing on a grill. Pre-heat grill for pork. Once pork has marinated for at least 10 minutes sear on both sides. Place pork in sandwich and then stuff all veggies, including mint, jalapeno, and cilantro into the bread loaves, top with hot sauce and squeeze fresh lemon juice on top. ← Sometimes I’ve believed as many as six impossible things before breakfast….